Every December, it shows up, full of those weird candy things and pieces of prunes. You might forget about it as the year goes by, but then, that special dessert makes its appearance again. A bad review is typically just the icing on a cake packed full of agent faux pas…what are these Realtors doing to leave such a sour taste in their clients’ mouths? It’s important to understand which scenarios stir up such deeply felt resentment, so we’ve compiled a list of the things agents should avoid doing at all costs. A Google search for “How to fire a real estate agent” turned up about 84,900,000 results. Clearly, there are a lot of folks on the hunt for ways to ditch their current agents. If this was a questionnaire seeking your opinion on client dissatisfaction, this is probably what most of you would have written down somewhere near the top. In today’s age of digital accessibility, clients expect to be kept abreast of developments and opportunities throughout the home buying/selling experience. It’s easy to forget when you’re juggling several sales at one time that your individual client only has his own on his mind. There is often little to no tolerance for delays in relaying or providing information pertinent to his situation. Believe it or not, that’s from a real agent review. Even subtle communication infractions can lead to a case of the grumbles, particularly if there are extensive negotiations, repairs, or financing-gymnastics associated with the sale. It’s essential to do follow-up calls, emails or texts consistently each day. Set aside specific blocks of time for staying in touch. That way, your clients will always feel connected to the process. They’ll also begin to develop an appreciation for your dedication and commitment to their sales experience, qualities that make for wonderfully positive reviews and feedback! You’re all aware (or should be, at least) that a picture can speak a thousand words. Of course it’s important to capture flattering photos to help highlight the positive features of the properties you’re listing. However, there’s a big ole’ difference between “highlighting the positive” and trying to pull off a full-on real-estate catfish! 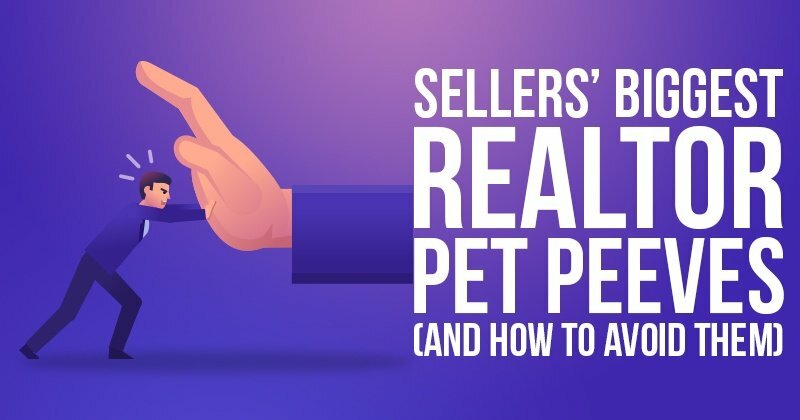 Not just a buyer’s pet-peeve, sellers frequently take issue with the photos their agents use to market their homes. But that doesn’t mean they’ll thank you for misrepresenting their house. A lot of time — and agent credibility lost — when interested parties get excited about falsely promoted properties. ...says the over-promising, under-delivering agent. If you’re any good (or on your way to greatness), you’ve probably learned that working in real estate means you need to be stellar when it comes to engaging confidence in your prospects. You have to talk the talk. Here’s another situation where, to really succeed, it’s necessary to paint a pleasant, promising picture — despite possible obstacles — when you meet with new clients. Inspiring confidence is an important factor when you’re trying to connect, and a certain amount of hopeful estimations and self-promotion is almost required to seal the deal. However, great care needs to be taken with big promises. Even with a listing that — for all intents and purposes — should sell like cake, a seller might still become frustrated if the initial buzz caused him to think a bidding war was imminent and he was going to walk away with $50,000 more than he originally hoped. Do your homework, be confident in your own figures and marketing scheme before trying to convince a client to come on board with your grand plan. There’s a whole world of difference between inspiring confidence and spinning hype. This one should be common sense, but, well...it’s not. You’d be surprised how many agents make appointments to show a home and then — gasp! — don’t show up! Do not be one of those agents! This business is all about getting listings, right? Wrong. It’s about getting and managing successful listings, start to finish. Don’t think that just because you signed a client, you can’t mess the whole thing up by pulling a no-show, or some equally unprofessional stunt... Remember that terrifying Google search? Thousands of people are ditching Realtors. So, this one is simple...just BE THERE. 5. It’s all about the money, money, money! The bottom line is, your clients always want you to score the most money and the best deal. Enough with the bad pricing and unrealistic low-balling! A good real estate agent should be able to study figures and comps to arrive at a reasonable number... every time! Don’t forget — if the list price is wrong, all your marketing efforts will be ineffective! If you want to avoid potentially harsh reviews and gain ultimate respect as an agent, consider boosting your business as a published author. Having a book gives you a leg up on other Realtors and helps you appeal to even the harshest of critics. Author website that can rank for your name in Google.